We got some work to do now. We need some help from you now. But you’re not fooling me, cause I can see, the way you shake and shiver. And those are still the words I still hum along to whenever I tune into broadcasts of this fond classic cartoon from the 70’s. It had brief comic book runs by different companies putting their own spin on the tale and they were faithful to the animation, like Gold Key. When I discovered this fond cartoon, not a day in my life could go by without me catching a rerun or reading the Harvey Comics reprint. Woe befell me when I heard about DC comics reimagining of this franchise and after picking up the first issue to read, I strangely found myself enjoying this post-apocalyptic look of my favourite canine turned cyber-mutt. No, Dynomutt has not been replaced but if later issues start affixing this Great Dane’s body with mechanical parts because he’s been hurt after his encounters with monsters (either attempting to run away or otherwise), I will cry foul. He wears a type of Google Glasses with holoprojectors to give him cartoon eyebrows and show how he’s feeling. What it does is to allow him and Shaggy to work together. The first issue sets up Fred and Daphne as a pair of media journalists — a cameraman and reporter. Velma is a tech wiz at a firm which hasn’t been given a name, but is known as “The Complex,” and Shaggy is hired by them to be their dog-handler. Unlike the other canines, patient 24602 (Scooby) instead of zero did not respond well to the conditioning to create completely obedient war dogs. At the same time, Project Elysium — a neuro-eugenics program to weed out base instincts (like greed and anger) from its subjects — is revealed as the MacGuffin to drive the series. This issue spends most of its time setting up the world and getting the gang together — to form a team of mystery solving miscreants — instead of giving a lot of story. Fred and Daphne are more like a bickering pair of co-workers than friends, Velma is self-absorbed in her work and Shaggy is second banana to no-one. He’s the hipster of the lot still, and what I enjoy is how Velma does not necessarily like him. The past toons have hinted at the two being interested in each other (moreso in Mystery Incorporated), and that’s a direction I’m not fond of. For this lad, he gets a solo story to explain how he first met Scooby and how they bonded. Trying to get used to a realistic look at pop culture’s favourite canine is tough. Reading this comic is like catching a reply of Cats & Dogs. There’s a hidden world of intelligent animals being created by geneticists and to see them explain how they can teach animals to talk is not surprising. When considering this world is cyberpunk, the science exists to grant anyone extraordinary ability. But if any of the science ever gets used for evil, oh boy are we in trouble! Well, we know where the monsters are coming from. The redesign of the gang is not completely bad when considering past television products included puppets and LEGO variants. 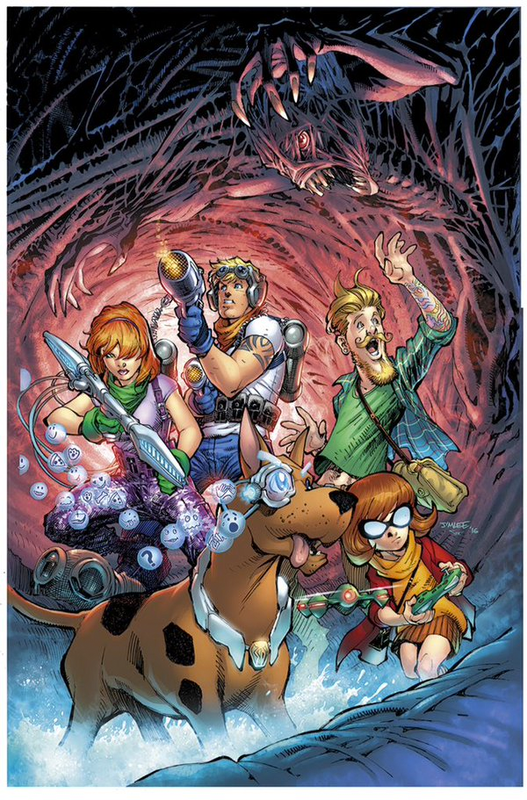 The latest series, Be Cool, Scooby-Doo, makes this comic book shine in comparison! Try as I might in wanting to enjoy the cartoon, the Family Guy style googly eye designs was far more off-putting than the stylish realism DC comics is going for. 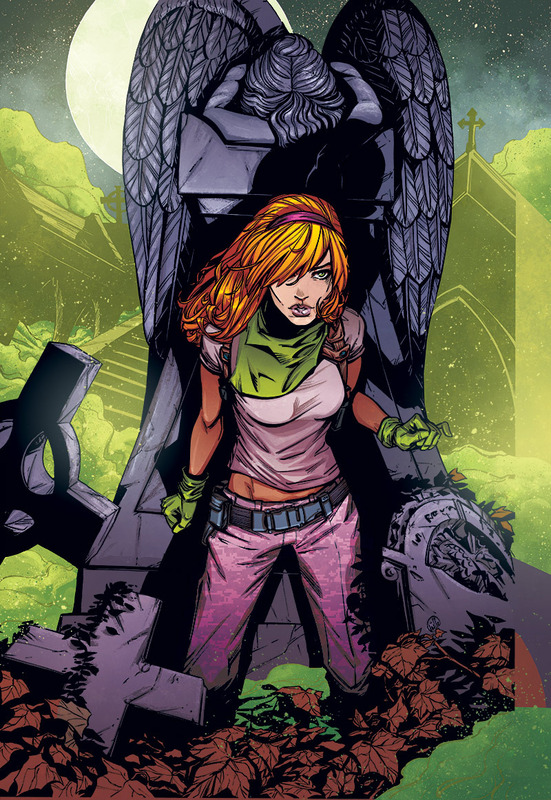 I can get used to the new Shaggy. Velma is far sexier than Daphne (Sorry, Red) and Fred can drop dead as far as she is concerned … the two are like a married couple with issues. Overall, artist Howard Porter paints more of a grim world in the backgrounds and character depiction. while this style is appropriate for any post-apocalyptic setting, the inverted idea subverts a lot of the aesthetics I enjoyed in the early Scooby Doos I watched. As for that mystery to solve, Scooby Doo. It won’t be till the next act (issue #2) where I won’t hold back in my opinion. I’m getting the idea the series is going to head down The Island of Dr. Moreau direction. Very rarely is the debut issue telling of whether or not the series is good! When I’m still hanging around Disney’s Haunted Mansion, there’s no escaping franchise cash grabs.